We have marked a distinct position in the market by manufacturing and supplying supreme qualityMS Beam Joist that is primarily used for construction purpose. This beam is engineered by making use of supreme class mild steel with the help of advanced technology. Also, we make certain that this beam joist is tested on various quality parameters to ensure its flawlessness. 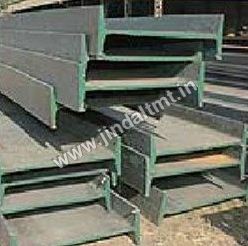 Furthermore, this MS Beam Joist offered in varied specifications at very reasonable price to the clients. Carrying load mainly in bending, a beam is a line structural. The Beams are defined by their length, their profile (cross-section shape) and their material. I-beam / wide-flange beam is a very common type of steel beam. Though a visibly sagging beam is structurally safe, but it is unsightly and should be avoided. And a stronger beam makes less deflection (the degree to which structural element is moved under a load). The Beams provide economical roof systems and floor in applications that require lighter weight systems and long clear spans. Their major applications are Flyovers, Pedestrians Walk Overs, Bridges and Buildings.